Join Big Data Analytics expert Jen Underwood as she dissects the 2018 Gartner BI & Analytics Platform Magic Quadrant, and shares some of the best practices data-driven organizations use to select and deploy Big Data Analytics solutions. 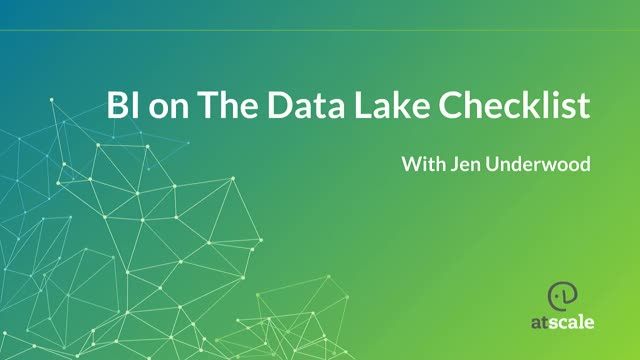 Finally, Jen will give each registrant access to her latest “BI-on-The-Data-Lake” deployment guide, a must-read resource for you and your team. Mainstream reporting solutions are not scaling to meet demands of the digital era. The 4 Vs of big data combined with modern BI strategies that enable self-service data access are overwhelming reporting tools and infrastructure. To empower insights-driven, analytical cultures in a new world of big data, organizations are adopting data lake architectures and AtScale semantic layers to enhance capabilities of existing reporting tools. Join Jen Underwood, Founder of Impact Analytix and Wendy Gradek, Director of Product Marketing at AtScale to learn about the key steps and implications that you need to take into consideration when planning a successful migration to BI on Big Data. - 10 steps to succeed when moving to a semantic layer for big data reporting. - What do you need to succeed to enable your BI for Big Data. - How to build a case and calculate business value. - Migration tasks involved in the process. Everyone is talking about cloud-based data platforms, but a lot of the talk is more questions than answers. What’s driving the move to the cloud? What are the implications for data management and analytics? How can I make a hybrid environment succeed? Who are the real players in the market and who should I pay attention to? Join Matt Aslett, Research Director for the Data Platforms and Analytics Channel at 451 Research, Saptarshi Mukherjee, leader of the data analytics and IoT product marketing function for Google Cloud, and Bruno Aziza, CMO at AtScale, for this deep dive into everything* you need to know about data and analytics in the cloud. *What technologies to support when deploying a hybrid environment. *About the implications on data management and how it affects your current big data environment. *About the implications of the separation of compute and storage for analytics workloads. *About the technology and business drivers to consider on this journey. If you're trying to deliver performant, scalable business intelligence on big data and the capability to handle large number of queries is a key issue for you, Google BigQuery is a choice well-worth considering. It is no surprise that more and more data workloads are moving to the cloud. The question is, how can you be successful at it? - How to support BI on the cloud regardless of the data size. - How to analyze all your data without breaking the bank. - What are the key factors for a successful BI on the cloud implementation. - Key factors to succeed with BI on the cloud. - How to get more from your existing data cluster. *Calculate quantiles on all of your data without requiring data movement or losing analysis accuracy. With AtScale 6.5, BI leaders and enterprise data architects alike will see a new way to gain access to and report on all your organization’s data. The webinar will run live at Wednesday, April 11, 11:00 AM Pacific Time. Big data is here to stay, and enterprises are determined to transform their data into strategic assets to inform operations and planning. Yet despite years of focus, investment, and effort, CDOs haven't reached a transformational level of maturity in data and analytics. What's holding us back? You won't want to miss this in-depth examination of what's driving big data today. No matter your role - CDO, architect, or BI leader - these six themes will guide you through the world of data and decisions. Semantic layers in business intelligence aren’t new. This handy concept abstracts and simplifies data into common business terms to facilitate and improve reporting. But compounding semantic layers across each BI tool isn’t a simplified solution. A new approach to semantic layers is needed - the Universal Semantic Layer. Join this webcast to learn how the modern approach of a single semantic layer will help you reduce data management complexities and give users timely access to the data that matters, in a secure and accurate manner no matter its source. Business intelligence and big data veterans Matt Baird, CTO at AtScale and Lucio Daza, Director of Technical Marketing at AtScale, will illuminate the hidden benefits of a universal semantic layer. They’ll share real stories across industries and pain points to bring to life how you can use a single semantic layer today to consume big data – quickly, simply, securely, and accurately. When it comes to Big Data Analytics, do you know if you are on the right track to succeed in 2017? Is Hadoop where you should place your bet? Is Big Data in the Cloud a viable choice? Can you leverage your traditional Big Data investment, and dip your toe in modern Data Lakes too? How are peer and competitor enterprises thinking about BI on Big Data? Come learn 5 traps to avoid and 5 best practices to adopt, that leading enterprises use for their Big Data strategy that drive real, measurable business value. In this session you’ll hear from Hal Lavender, Chief Architetect of Cognizant Technologies, Thomas Dinsmore, Big Data Analytics expert and author of ‘Disruptive Analytics: Charting Your Strategy for Next-Generation Business Analytics, along with Josh Klahr, VP of Product, as they share real world approaches and achievements from innovative enterprises across the globe. Watch this online session and learn how to reconcile the changing analytic needs of your business with the explosive pressures of modern big data. Leading enterprises are taking a "BI with Big Data" approach, architecting data lakes to act as analytics data warehouses. In this session Scott Gidley, Head of Product at Zaloni is joined by Josh Klahr, Head of Product at AtScale. They share proven insights and action plans on how to define the ideal architecture for BI on Big Data. Big data creation, collection and applications have influenced business decisions more than ever in 2017, and if advances in artificial intelligence, virtual reality, and enterprise applications continue to prove valuable ventures, 2018 will be even bigger. With this in mind, how businesses approach and advance their big data maturity and cloud strategy can make or break the year. Whether it's running Hadoop workloads on-premise, public cloud, or hybrid deployments; maintaining continuity among the data, the applications, and the users must be top of mind. - What are the best use cases for cloud deployments? Abstract: Check out AtScales’ 2016 Big Data Maturity Survey Results in this fast 2min video summary including data from more than 2,550 Big Data pros, across over 1,400 companies and 77 countries. The AtScale Big Data Maturity Survey Report and scope is unparalleled and defines the current state of the industry providing real-world analysis to help you with your 2018 Big Data strategy. With more data comes more users and now control and security is a concern. We want to share lessons learned via use cases from leaders in the industry and key considerations that drive adoption and expansion of data analytics tool use. This power session will help your enterprise define key success factors in order to avoid end user pitfalls, leverage familiar tools and achieve faster results. David Mariani: CEO and Co-founder Dave Mariani is a Technology executive with 25 years of experience in delivering Big Data, Consumer Internet, Internet advertising and hosted services platforms, creating nearly $600 million of enterprise value. He has created the world’s largest data platforms including a trillion row Hive data warehouse at Klout and the world's largest cube at Yahoo!. Bruno Aziza: Chief Marketing Officer Bruno Aziza has a Masters Degree in Economics and was educated in France, the U.K., Germany and the U.S. Prior to AtScale, Bruno ran Marketing at Microsoft, SAP/Business Objects and drove the ascension of big data startups like Alpine Data Labs and SiSense. Have you conquered big data? Ventana Research reports 4 out of 5 organizations agreed analytics on big data is essential to future company success, however, in that same study, they found companies that succeeded in capturing all that data in one place didn’t always succeed in getting value out it. How can you ensure if you go ‘big data’ that you get the immediate return on your latest investment? David is responsible for the overall research direction of data, information and analytics technologies at Ventana Research covering major areas including Analytics, Big Data, Business Intelligence and Information Management along with the additional specific research categories including Information Applications, IT Performance Management, Location Intelligence, Operational Intelligence and IoT, and Data Science. Your enterprise depends on your prowess in optimizing data and insights on that data. As your organization grows, so goes your data warehousing and BI needs. In this 20min power session, David Mariani, CEO at AtScale, and Bruno Aziza, CMO at AtScale, will share do's, don'ts and secrets to maximize for capacity, cost control and delivery of insights from the industry leader in making BI work on big data. CEO and Co-founder Dave Mariani is a Technology executive with 25 years of experience in delivering Big Data, Consumer Internet, Internet advertising and hosted services platforms, creating nearly $600 million of enterprise value. He has created the world’s largest data platforms including a trillion row Hive data warehouse at Klout and the world's largest cube at Yahoo!. Chief Marketing Officer Bruno Aziza has a Masters Degree in Economics and was educated in France, the U.K., Germany and the U.S. Prior to AtScale, Bruno ran Marketing at Microsoft, SAP/Business Objects and drove the ascension of big data startups like Alpine Data Labs and SiSense. The average BI tool is 22 years old. Don’t expect any of them to work natively with Big Data. Learn how to add speed, scale and security across all of your Big Data assets. With storage costs declining over 20% in the last year, keeping your data is cheaper than throwing it away. Are you making the most effective use of your growing data lake? Depending on where you sit in your organization, the answer might be ‘no’, since every BI tool has its own requirements, and moving data to satisfy unique BI needs, takes more effort than just a file transfer. Join this webcast to learn why adding business logic to its architecture, Big Data environments can increase their simplicity regardless of the ingestion method. BI and Big Data veterans Matt Aslett, Research Director at 451 Research and Lucio Daza, Director of Technical Product Marketing at AtScale will deliver this session covering current industry trends, real use case scenarios and answering questions from the audience. - How business logic adds value and simplicity to your Big Data environment. - The differences between traditional and emerging data-to-insight approaches.